CLOVIS, CA--(Marketwire - January 24, 2011) - With the snow piling up on California's mountains, action sports enthusiasts are chomping at the bit to hit the slopes. In an effort to accommodate these extreme sports fans, the Fairfield Inn and Suites hotel in Clovis, CA is proud to offer special rates for travelers staying on property during a trip to China Peak Ski Resort. With over 1,600 vertical feet of terrain and a peak of 8,700 feet the locally owned and operated resort offers big Sierra excitement without the endless travel -- putting skiers and snowboarders on the slopes quicker than ever. Located just 65 miles northeast of Fresno, Ca., China Peak Ski Resort offers 7 chairlifts, T-Bar servicing for the new freestyle terrain park, two handle tows and a moving carpet for beginners. China Peak is located at Huntington Lake in the scenic Sierra National Forest. Skiers and snowboarders taking advantage of the special rates, starting at just $92.00, must have a copy of the lift ticket present at the time of check-in in order to receive the discount. Lift tickets must be valid for the current year and the special discounted rate will expire on March 31, 2011. The ski resort offers a variety of services from lessons and dining as well as an inn. China Peak offers multiple discounts as far as group rates, senior discounts, high school discounts and season passes. For the less experienced skiers and snowboarders China Peak offers personal lessons for children and adults of all skill levels ranging in price from $59 to $209. The resort also has a rental shop for those without their own equipment. For a nice family get away China Peak is sure to please even the most discerning family member. From a variety of dining options, multiple trails, lessons and multiple events China Peak is a great getaway. For more information on China Peak, please visit them online at http://www.skichinapeak.com/default.aspx. 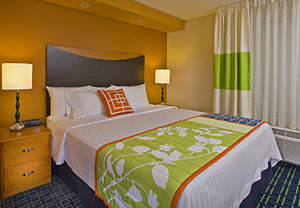 Since it opened in January of 2009, the Clovis conference hotel near Fresno has welcomed visitors with a complimentary hot breakfast and ensured that its modern, comfortable rooms featuring the luxurious "Green Tea Bedding Package" are prepared to be a pleasant and relaxing home away from home. The hotel is 2- 4 miles from all sporting events in Clovis and is located in the safest area of the county. Fairfield Inn & Suites continues to provide, and raise, the standards of excellence for which Marriott properties are known and has become a standout among hotels near Fresno Airport.